Although one might think that your location would matter in a work-at-home call center job, that is not necessarily the case. Only a handful of work-at-home call center companies hire in all states, and even fewer internationally. Some states have a lot, while others have very few call center companies. Washington DC is, unfortunately, one that has fewer than most. The ones that do hire in DC are often the type that hires independent contractors rather than employees. Company hires as independent contractors technical support agents to do troubleshooting and software support and customer service agents in work-at-home call center positions The jobs pay is a per-minute comp structure that tops out at $10 per hour. The application is via email. Financial services company uses remote agents in its travel division, hiring home-based travel agents and customer service agents (especially those with experience in reservation systems) in its Axcess@Home program. Bilingual agents needed also. This work-at-home call center program from Apple's AppleCare division hires both college students and non-students for full- and part-time positions. Apple provides a computer and phone. This company's home-based employees work in customer service, sales and B2B telemarketing as well as insurance auditor sand LPNs and RNs doing telehealth work. Independent contractors receive inbound calls to do third-party verification for utility, cable and financial services clients in these home-based call center jobs. Agents can choose shifts as short as two hours. Pay is $8.50/hour. Agents bilingual in Spanish needed. The company provides remote technological support to clients, via home-based tech support chat and call center agents. Its remote services technicians answer inbound calls and its solutions center supervisors support and supervise the remote services technicians. 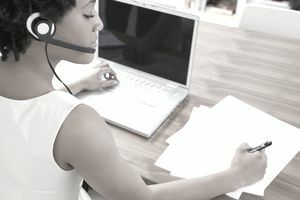 Work at home call center agents, who are independent contractors, use a predictive dialer system to make verification calls for the company's clients, which are primarily from the newspaper industry. Independent contractor, virtual call center agents handle technical support, sales, ticketing and customer service for Working Solutions' clients. There are also some work-at-home data entry and editing jobs. At almost all of these companies, whether they hire independent contractors or employees, call center agents are expected to provide their equipment (computer, phone) and services (internet and phone).